He was escorted by the police to an ashram in Kakinada on Wednesday. 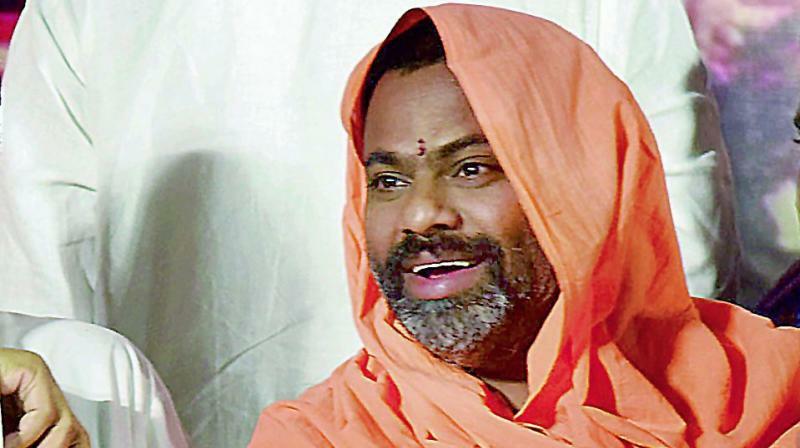 Hyderabad: Sri Peetham pontiff Swami Paripoornananda of Kakinada was externed from Hyderabad for six months for making “provocative statements”. He was escorted by the police to an ashram in Kakinada on Wednesday. The police said that the pontiff was externed from Hyderabad under the Telangana Prevention of Anti-Social and Hazardous Activities Act. Two days ago, Tollywood actor and film critic Kathi Mahesh was externed from the city for reportedly making derogatory comments against Hindu gods in a news channel, resulting in protests in the city. The police on Monday had placed Swami Paripoornananda under house arrest at his Jubilee Hills residence. He was scheduled to lead a ‘Dharmika Chaitanya Yatra’ from July 9 to 11 from the Shiva temple in Bodduppal to Yadadri by chanting ‘Sri Rama’ in protest against the comments of Kathi Mahesh. The pontiff had condemned the controversial statements made by Kathi Mahesh and said that it was improper for him to talk about Lord Rama who is worshiped and revered by lakhs of people. The police said that the pontiff was barred for the provocative statements made at public meetings in Narayankhed and other places. The police asked seer to leave Hyderabad on his own but when he failed to do so, the police took him into custody in the early hours of Wednesday and shifted him out of the state.